I’m not sure if any of my local papers (5 titles, four of them free come through my door each week, several on a fairly direct route to the recycling bin) bothered to send a photographer to our local Remembrance Day parade and service. I did see one other photographer there, although I think he only took a couple of pictures – but that could have been what the paper wanted. PR shots, handouts and free snaps from people and organisations who want publicity provide 90% of the photos, with the rest coming from a few remaining poorly paid and overworked staff. 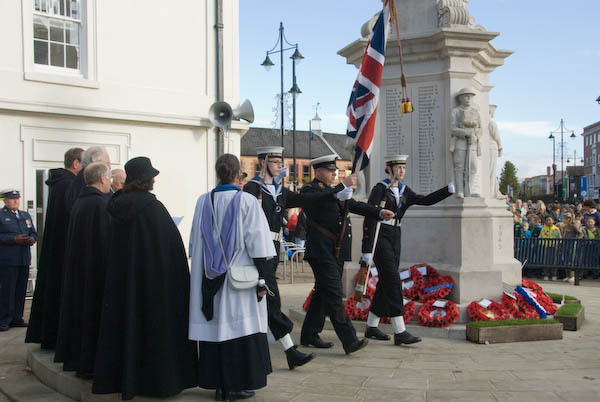 So if anyone in Staines wants to see pictures from the Remembrance Day parade and service – and it was a well attended event – they can look on My London Diary. I went there to photograph it because I wanted to take some pictures to mark the occasion, but didn’t want to cover the national event in Whitehall – too much security, too little access. I could have gone to any of the hundreds of other such events around the country rather than Staines, but that’s where I live. This entry was posted on Sunday, November 11th, 2007 at 06:27 pm and is filed under My Own Work. You can follow any responses to this entry through the RSS 2.0 feed. You can leave a response, or trackback from your own site.